The equipment has short change over time from one job to another thus ensuring optimum equipment utilization and greater profitability. The compaction of the equipment is computer controlled thus well regulated and structural consistency of the pipes is achieved. The equipment can be installed with an automatic crane, adjustable floor system and pipe testing capabilities as well as base pallet control system. Current machines are developed with a two directional head system, which enables manufacture of concrete pipe with a good wire and concrete bond as well as great compaction. 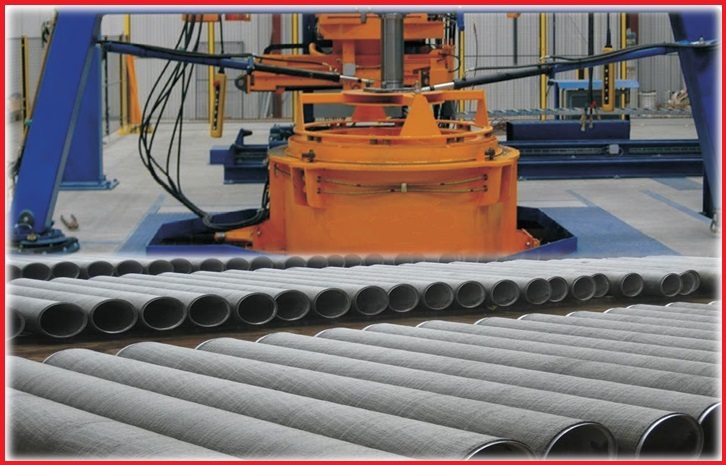 The hume pipe making machine is developed with a unique frame design that allows for easier feeding of multiple materials and rapid pipe assembly. This vertical cast process has been found very efficient and with great ability for greater automation. The design of the system also enables ease of servicing the equipment as well as access for routine maintenance practices. The total clean up time is effectively reduced since there is less material spillage during production. During construction, the use of the steel pit base shell greatly reduces the total installation time and production starts in shortest time possible. The concrete pipe machine is available in various models based on the desired output capacity, pipe diameter and pipe length. The cross head drive system and power unit situated on frame at conveyor level for better power transfer and easy service and maintenance. The equipment has also been equipped with noise dampening system to enhance the user friendliness. The capacity of the hopper is based on the size of the machine. It is constructed with innovative rounded corners that help prevent build up of materials during operation. A liner can also be added to enhance flow of material through the equipment. The conveyor system is driven by rollers, which are completely sealed to prevent ingress of particles and ensure ease of maintenance. Control system has been developed either as manual or computer aided. For the automated machine operation, adjustments are made with a touch screen interface in a flexible support system. Innovative video screen monitor have also been added to the control system for monitoring machine performance via installed video cameras. The oscillating tongue mechanism; this system can also be incorporated, for production of roll- in/ profile jackets. The pipe-making machine can also come with different voltage levels, starter options, and even automatic lubrication system. The Hume pipe making technology continues to undergo rapid innovation, which has led to increased range of manufactured products. The machine can produce box culverts, manholes, catch basins and other products requiring this molding technology. This entry was posted in Concrete Pipe Machine, Pipe Making Machines by Mitul Patel. Bookmark the permalink.